Neil Basu, Britain’s top counter-terrorism official, announced on Wednesday evening that a couple poisoned in the county of Wiltshire appear to have been exposed to Novichok, the Soviet-era nerve agent behind the poisoning of former double agent Sergei Skripal and his daughter Yulia in Salisbury earlier this year. Russia was once believed to possess thousands of tonnes of weaponized Novichok varieties and their precursors, according to a 2014 report by the U.S.-based Nuclear Threat Initiative, a non-partisan group working to reduce the threat of weapons of mass destruction. Sturgess and Rowley were residing “barely eight miles” from the site of the original poisoning, according to the Guardian. It remains unclear whether they could have been exposed to the same batch of Novichok as the Skripals, though an extensive, months-long cleanup effort involving 200 military personnel began in April. The Guardian added that Basu warned against panic, cautioning that authorities had no evidence the two visited any of the previously decontaminated sites. The Russian government denies all involvement in the poisonings and has floated a number of self-exonerating theories such as a breach of security at Porton Down. However, many in the West have become suspicious about a string of dozens of deaths on UK soil widely speculated to be linked to Russian security services or organised crime. 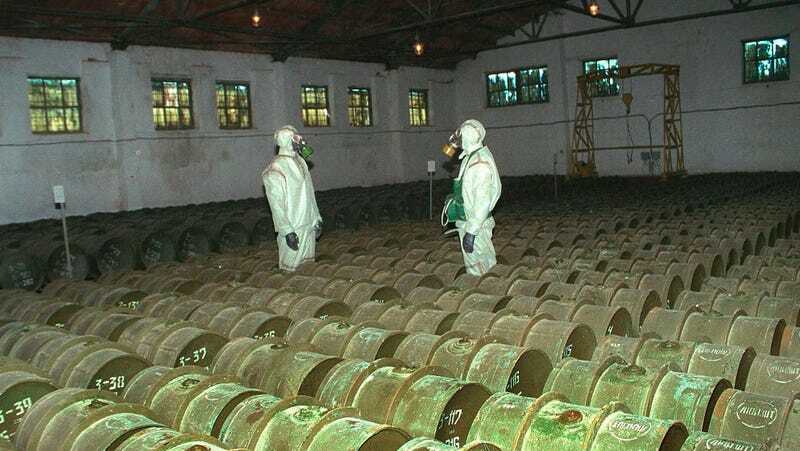 Russian troops at a chemical weapons storage facility in Gorny, 100 miles south of Saratov, Russia, in May 200. Russian officials have also insisted that Novichok agents are not stable and degrade quickly, meaning there would be minimal risk of detection by British authorities or exposure weeks after the incident—though Brigham and Women’s Hospital in Boston toxicologist Peter Chai told the Verge such agents are “really oily so they persist in the environment.” They are also extremely potent, with the survival of those exposed beyond the short term suggesting the agents were either low quality or haphazardly administered.